The App Store appears to be experiencing issues at this time, with many customers unable to access the store to make purchases and install updates to apps. It appears the iTunes Store is also affected. 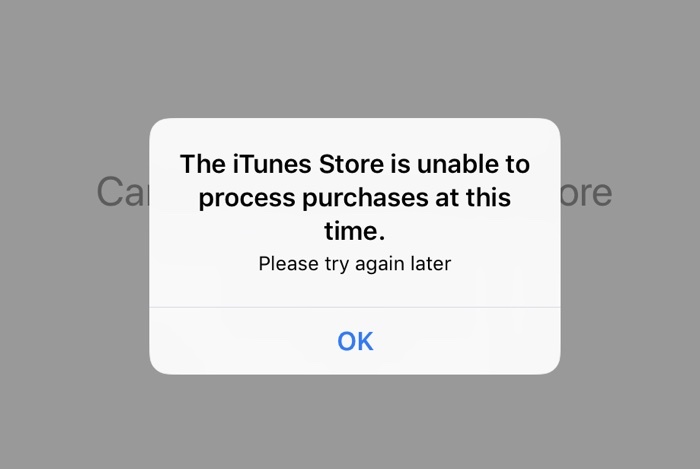 Affected customers are getting a popup message that reads: "The iTunes Store is unable to process purchases at this time. Please try again later." The App Store issues have been ongoing for approximately a half hour now, but no outage is listed on Apple's System Status page. We'll update this post when the issue is resolved. Problems like this are often fixed quickly, so apps shouldn't be unavailable for too long. Update: Apple's System Status page now displays issues with the App Store, Apple TV, iTunes U, iTunes Store, Volume Purchase Program, and Mac App Store. Super annoying. Keeps popping up over and over. Not just iOS, macOS too. Been getting this error for a couple of hours and it is really getting annoying. Not even trying to purchase anything or update. Just using my phone and still getting the pop-up. I was getting this message on the Facebook app for some reason. Got a little paranoid that Zuck went succ with my bank balance but pleased to hear it's not just me. Was first reported around 2:19 PM EDT (U.S.) by @ReportOutage on Twitter. I'm not even trying to purchase anything. The message keeps popping up in Safari on iOS. Yep, me too. Happening right now. I'm upset. I'm calling Anderson Cooper for an interview. Lol, I thought I was the only experiencing this!